Please Note: We now have bulbs in stock, they are £2.50 per pack and £25 for 10kg. Call us on 020 8421 5977 to find out more, contact us here, or ask us about our delivery price and delivery areas or see here for more detail. Spring bulbs, plant now for a lovely show in the New Year from February until October. Snowdrops (galanthus) Plant from Sept-Dec and watch them flower from Feb-March. Plant 7cm deep and space 7cm apart and they grow to 12cm high. Each year the bulbs will multiply giving you a wonderful show. Crocus: plant now to get a lovely show from Feb-March. Plant 5cm deep and space 7cm apart and they grow to 8cm high. A mixture of colours in a pack of 20 bulbs. Narcissuss or Daffodills: plant now to have a lovely show of these wonderful flowers in March and April. Plant 10cm deep 10cm apart and they grow from 20cm to 50cm. Tete a tete are ideal for a rockery or hanging basket or just in pots on the balcony, veranda or patio. Hyacinths: We have mixed packs and 4 single colours. These grow well in pots, gardens and baskets. Plant 10cm deep, 10cm apart and grow to 25cm high. The fragrance and colour will brighten your day and make people notice your garden and admire the look. Muscari Plumsum and Armeniacum: These multiply quite quickly so each year the area of ground is covered even more, in tubs, pots, baskets or in flower beds these little bulbs give a strong eye catching show of colour. Lilies: These can be planted from Sept-Dec and also Feb-May. 10cm deep and apart and grow to 90cm high. These grow well in the garden borders and pots giving a beautiful show of colour from May-October. 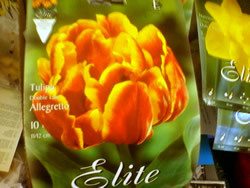 Tulips: We have a large range of tulips from small to large, many colours plain and mixed and even frilly edged ones. We hope you have found this information on garden bulbs useful. If you need further assistance please contact us for more advice and information. Don't forget you can also get garden bulbs posted straight to your home. Call us on 020 8421 5977 to find out more about our delivery price and delivery areas or see here for more detail.